Metalwork has been considered a masculine practice due to the laborious, physical processes involved in manipulating metal. Despite this stereotype, women have long been artists and manufacturers in this dynamic medium. 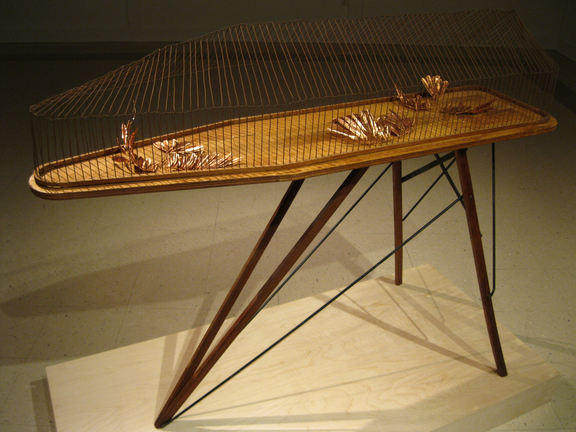 NMWA’s fifth Women to Watch exhibition, Heavy Metal, spotlights contemporary women artists who work with metal. 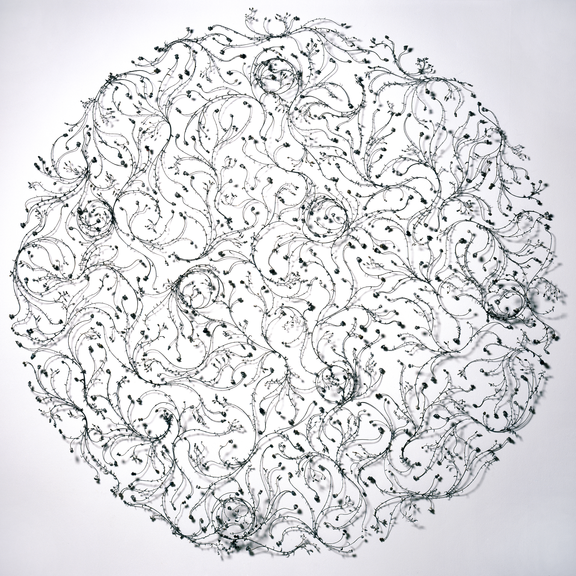 These artists employ fascinating, diverse processes in the creation of their works. While many of the featured artists manipulate scrap and recycled metal to make their works, others cast with liquid metal to create new objects. Beverly Penn’s intriguing, detailed bronze sculptures of invasive plants, such as Maelstrom (2011), are cast directly from the plants themselves. Penn calls this method “lost plant casting,” a play on the ancient metalworking method of lost wax casting. It also references the fact that plants burn away in the casting process. In this sense, the resulting sculpture is like a memorial to the plant, immortalized in metal. Other Heavy Metal artists find the process of creation to be a deeply personal or cathartic one. 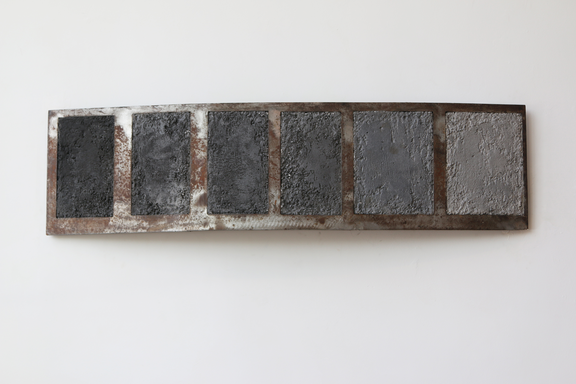 Leila Khoury’s steel and concrete works respond to the horrors of the ongoing Syrian civil war, which began during her time in art school. Khoury, of Syrian descent, created Palmyra (2015) in the aftermath of the destruction of the ancient city, attempting to create an image of the place from her own memories. Khoury’s sculpture Summer House (2015) references her childhood memories of visiting her grandparents’ home in Syria. The structure recalls a row of windows, which Khoury filled with cement to symbolize that she may never return there. She describes the process of making as a way of grieving. Holly Laws’s Three Eastern Bluebirds (2017), made from cast bronze, a found ironing board, and plywood pedestal, is a response to the outcome of the 2016 U.S. presidential election. For Laws, this work served as her own “personal art therapy.” She meticulously cast 144 bird feathers for Three Eastern Bluebirds. Artists such as Laws reclaim meticulous handwork and other craft techniques, which have traditionally not been considered high art. Alice Hope also used repetitive handwork to create her untitled 2016 sculpture. Hope patiently strung together thousands of crimson Budweiser beer can tabs—which the artist refers to as “found color”—into a massive spiral form. The variance and vibrancy of the works in Heavy Metal testifies to the intriguing and often innovative methods that these women artists apply to metal. This entry was posted in NMWA Exhibitions and tagged Alice Hope, Beverly Penn, Holly Laws, Leila Khoury by Women in the Arts. Bookmark the permalink.